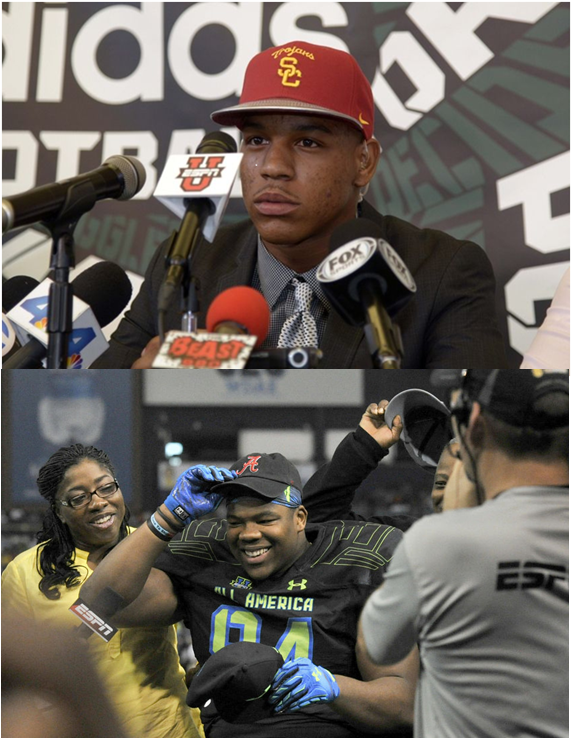 Which school did the best on National Signing Day? The “calculated” consensus of four college football experts – FOX Sports, CBS’ 247sports.com, Bleacher Report and Yahoo!’s Rivals.com – is two schools: Alabama and USC. What is National Signing Day anyway, for those who need to know? Beginning on the first Wednesday in February, high school seniors (in this case, football players) can sign National Letters of Intent (NLI) to play for a top tier NCAA football program. According to nationalletter.org, “The NLI is a binding agreement between a prospective student-athlete and an NLI member institution. The Trojans and Crimson Tide were picked the 1-2 best recruiters on Day 1 in 2015 by two experts apiece. CBS and Bleacher Report went with Alabama, while FOX Sports and Yahoo! went with USC at the top. Beside the Crimson Tide, what about this season’s other “Final Four” schools in the College Football Playoffs (CFP): the champion Ohio State Buckeyes, runner-up Oregon Ducks and Florida State Seminoles? Florida State potentially improved the most with their new recruits, followed not too far away by Ohio State – but the Seminoles are losing Jameis Winston to the NFL draft while the Buckeyes remain intact at quarterback and elsewhere. Alabama and Ohio State will be right back in the mix in 2015. The Seminoles? We’ll have to see. Meanwhile, the Ducks, losing their 2014 Heisman-winning QB, Marcus Mariota, to the NFL Draft – and pulling up 18th on signing day – might need a few seasons to catch up again. To get the composite ranking below, I took the four sets of rankings and simply added the ranks, with the lowest totals ranked highest (i.e. USC, 6 = Alabama, 6 < a surprising third-best Tennessee, 17). For ties (i.e. Clemson, LSU and Georgia), the school with the best highest ranking (HR) got the nod. For those schools at the bottom and not on all three lists, they are first ranked by school on (3) of the lists, then (1). Check out my sources, where each ran it out to No. 25, by clicking on the titles in the second list below – and go deeper into the top schools’ signings. There’s no doubt about it. 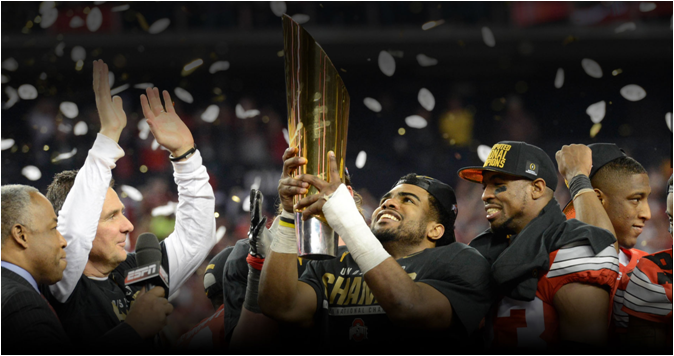 Ohio State is truly the undisputed 2014 National Champion, winning the first ever College Football Playoffs (CFP) in certain fashion – cutting through Alabama and Oregon for the title. But who was predicted to win it all way back in August? The AP was calling for a Florida State repeat. It’s hard to predict the overall season-ending No. 1, and you still have to give the preseason rankings some credit. The top five – minus a poor Oklahoma – are in tact though jumbled, and 16 of the preseason rankers made the final cut. That also means nine dropped out and nine climbed in, including the early-on, way-underrated TCU Horned Frogs, who went from nowhere to No. 3. PRESEASON 2014 RANKING TEAM FINAL 2014 RANKING FINAL 2014 RECORD UP OR DOWN? DIFF. 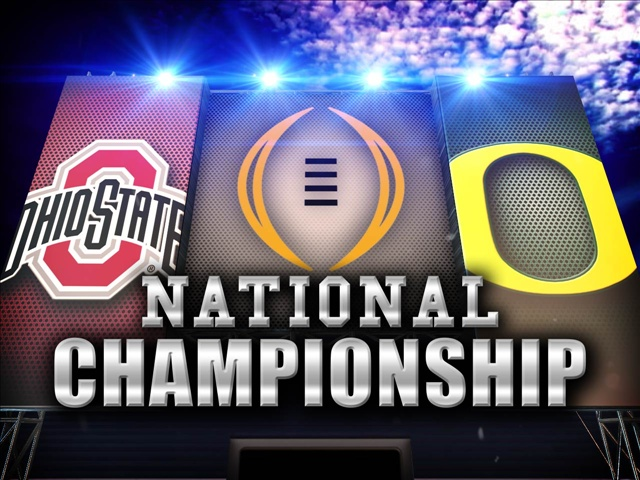 If you include championship or title games, Ohio State is appearing in its 46th Bowl game this evening and Oregon its 29th. The Buckeyes and Ducks have met two times before on so (ok, not quite as so) grand a stage: the 1957 and 2009 Rose Bowls. Ohio State came out on top both times.